NES Teenage Mutant Ninja Turtles III: The Manhattan Project (USA) in 30:30.87 by xipo. TMNT3 is the last installment of the TMNT series on the NES. 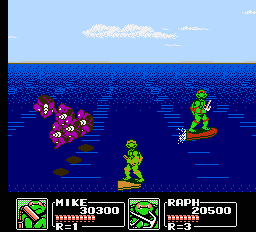 Unlike in the second game, the turtles have different special attacks with different power and speed. The special attack also consumes one life point, unless there is only one life point remaining. Raphael is by far the fastest turtle, but he also has the weakest special attack. Michaelangelo has the strongest special attack, though he is slow. Leonardo is also used occasionally in this run, since his special attack can hit some bosses twice. Unfortunately for Donatello fans, Don is not used in the run. This movie improves the previous one by over 3 minutes, due to the use of two turtles and careful management of score and health.